A pellet grill is an investment worth having at home, especially if you like hosting parties with family and friends. Whether for smoking or grilling, among other things, it will help you to prepare a feast and have a good time. However, picking the right pellet grill is not an easy undertaking, especially given the abundance of the options that you will most probably be confronted with. In this comparison article about Traeger vs Rec Tec, we will take a look at two of the brands that have made their marks in the global market. We will have a glimpse of some of the features to look for in a pellet grill and see how each of the brands fare. To make the comparison easier, we will also be choosing one model from each brand. This is directly proportional to the size of the grill. Obviously, the bigger the grill is, the larger is the cooking area. You need to think about the number of people who would often eat when you are grilling. Do you usually prepare food for a small or large group? The answer to this question will help you to decide the cooking area that is best for your needs. In the case of the Rec Tec Wood Pellet Grill, the cooking area is 702 square inches. This is tall enough to fit even large chickens and turkey. Meanwhile, with the Traeger Texas Elite 34, the total cooking area is 646 square inches. Based on the specifications from the manufacturer, this means that it can grill eight whole chickens, five rib racks, and 30 burgers. Between the two, it is obvious that the Rec Tec grill is the one with the larger cooking area. However, if you want one that is small, there are many other choices from Traeger that will be worth considering. To determine the durability of the grill, you also have to take a look at the materials that are used. Look for one that is made of stronger material, which also means that it can deliver long-term functionality, and hence, excellent value for money. Rec Tec Wood Pellet Grill is made of heavy-duty stainless steel. On the other hand, Traeger Texas Elite 34 is made of powder-coated steel. The heavier material in Rec Tec makes it better in terms of durability. To add, this can also improve the ability to maintain the right temperature since it is thicker. This is important as it will be indicative of the overall functionality of the wood pellet grill to purchase. You need to think about the temperature settings, including how they will be set. One of the common features in the grill from Traeger is the Digital Elite Controller. The latter will make it easy to set the desired temperature and have it maintained at +/- 20 degrees Fahrenheit. There is also a small screen that will clearly display the current temperature, making it easy to monitor progress. It has a maximum temperature range of 400 degrees Fahrenheit. Rec Tec also comes with a digital control and a screen. It has Smart Grill Technology, a feature that has been exclusively developed by the company. The latter allows it to maintain the precision of the temperature from 180 to 500 degrees Fahrenheit, depending on what is chosen. Rec Tec has a wider temperature range, which will allow it to be useful in more applications, especially when high heat is required. The controller is also more advanced compared to Traeger. 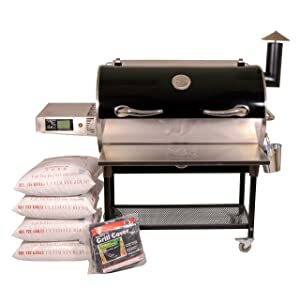 You also have to consider the portability of the wood pellet grill that you will purchase, especially if you expect that you will have it moved from one place to another. It does not necessarily have to be lightweight, but it will be good if it has wheels, which will make it easy to have it moved from one place to another. Luckily, both of the models have four wheels. This means that you can have it easily pushed when it needs to be transferred to a different location. The hopper is an important part of the grill because this is where the pellets will be placed. A larger hopper is better because it means that it is going to handle more. If it is small, you will need to have it refilled within a short span of time. The Traeger Elite 34 has a hopper that can hold only 18 pounds. This is as against the Rec Tec grill, which can hold up to 40 pounds of pellets. Obviously, we would choose one that is larger, which means that you can cook for a longer period without being worried that you have to refill the hopper. This is the part where the food will be placed as it is grilled, smoked, or whatever cooking application is done. It should be made from a material that is long-lasting. It must resist rust and corrosion so that it won’t be easily prone to wear and tear. Rec Tec Wood Pellet Grill has grates that are made of ¼ inch stainless steel rod. On the other hand, Traeger Texas Elite 34 has porcelain grill grates. To be honest, there is not much of a difference between the two. They are durable and easy to clean. This is a fancy feature that you can do without, but would be nice to have. This will be handy when you are grilling at night. The light will provide the illumination that is needed so that you can easily monitor the progress of grilling. From the two models that we are comparing in this article, only the Rec Tec comes with an interior light. While we have been referring to it as a wood pellet grill, this does not mean that grilling is the only thing that it can do. For a product that is as expensive as these two grills, it should be useful for other applications as well. The Rec Tec Wood Pellet Grill is not only for grilling, but can also be great for smoking, searing, and baking. Meanwhile, the Traeger Texas Elite 34 is also great for baking, braising, searing, smoking, roasting, and barbequing. For your peace of mind, you need to choose a product that comes with an extensive warranty coverage. Under the warranty period, the manufacturer will offer free repair and replacement of defective parts, provided that you abide by the terms and conditions. If the issue is due to your negligence, the manufacturer will not honor the warranty. The Traeger Elite 34 comes with a 3-year warranty, which is the standard for the company. Rec Tec, on the other hand, comes with a 6-year warranty, which is obviously the better option between the two. In this section, we will have a closer look at the two products from this brand and what you can expect when they are used. This review will make it easier to decide which one is better for your needs. They share almost similar features and the outcomes will also almost be the same, but one has to definitely stand out. Being the more expensive option between the two, this is definitely for those who have the luxury of financial resources. If you want quality, this is what I can personally recommend. This is one of the most user-friendly grills that you can have. You do not have to exert a lot of effort in its use. All that you have to do is to load the pellets, set the Smart Grill Technology Controller, and add your meat. However, the assembly can be quite complicated. You will need to have a helping hand. A wrench and a screwdriver will be needed. Nonetheless, the manufacturer provides detailed step-by-step instructions. The heat setting is one thing that makes this great since it can be able to reach 500 degrees Fahrenheit. This makes it more versatile since the temperature is higher. Whether it is steaks or chops that you are cooking, among others, you can easily do so with the heat that is produced by this unit. 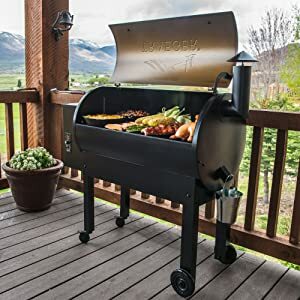 This is not a perfect grill. There are also some drawbacks that can be apparent. For instance, there is no pellet hopper release. This, however, is not that significant to ditch the idea of having this chosen over its competitors. This is cheaper compared to the option from Rec Tec that has been mentioned above. Nonetheless, the price is still quite steep compared to the more budget-friendly alternatives that you can find from other brands on the market! There is a digital controller on the side of the unit, which will make it easy to choose the desired setting. The knob can be adjusted in 11 different settings, depending on what is it that you are cooking. On the top of the knob, there is a screen that will make it easy for you to monitor to th current temperature. With the grease management system that is found in this model, cleaning will be almost effortless on your end. There is a bucket on the side, which will catch the drips when grilling. This will prevent the grill area from being messy. Another thing that is worth noting in this model is the heated convection process. There is an induction fan that allows the circulation of air for robust flavor and aroma. While it does an excellent job in convection, it should be pointed out that it is energy-efficient. In fact, it uses only 300 watts of power in the first four minutes and 50 watts in the next minutes of cooking. When it comes to the cooking area, Rec Tec Wood Pellet Grill is slightly larger. Rec Tec is better in terms of the material used, which is heavier and thicker. It is not only longer lasting, but it also helps retain the right temperature. Rec Tec has a higher temperature range, which can reach 500 degrees Fahrenheit, while Traeger Texas Elite 34 is only up to 400 degrees. Both of the grills have wheels, and hence, they can be excellent in terms of portability. Between the two, Rec Tec comes with a hopper that has a larger capacity, which is 40 pounds, as against the 18 pounds of Traeger Texas Elite 34. The two grills have grates that are made of different materials, but they are both exceptional in terms of durability and ease of cleaning. Rec Tec has an interior light and Traeger Elite Texas 34 does not have any. The two grills are the same in terms of versatility, which means that you can use it not only for grilling. The warranty of Rec Tec is better, which is six years, as against the three years of warranty that is being offered by Traeger. From the things that have been mentioned above, it is clear that the two are pretty much identical. However, if there is only one that I would personally choose, it is the Rec Tec Wood Pellet Grill. It can be more expensive, but it has an abundance of innovative features that will make it worth every dollar that you will be spending.